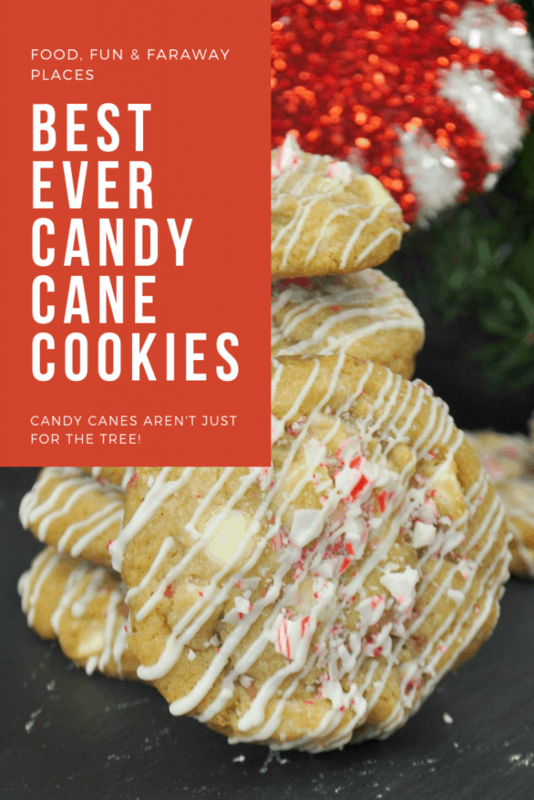 This Candy Cane Cookie recipe turns out such a delicious treat, and they are easy to make! This will be the most festive dessert on any holiday table! Seeing candy canes in the stores means Christmas is on the way. My kids have always loved them. I remember one year we kept saying there was something missing on the tree, and finally, we realized it was the candy canes! Do you put them on your tree? 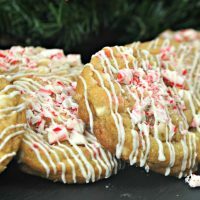 It’s surprising how delicious candy canes are with white chocolate chips. 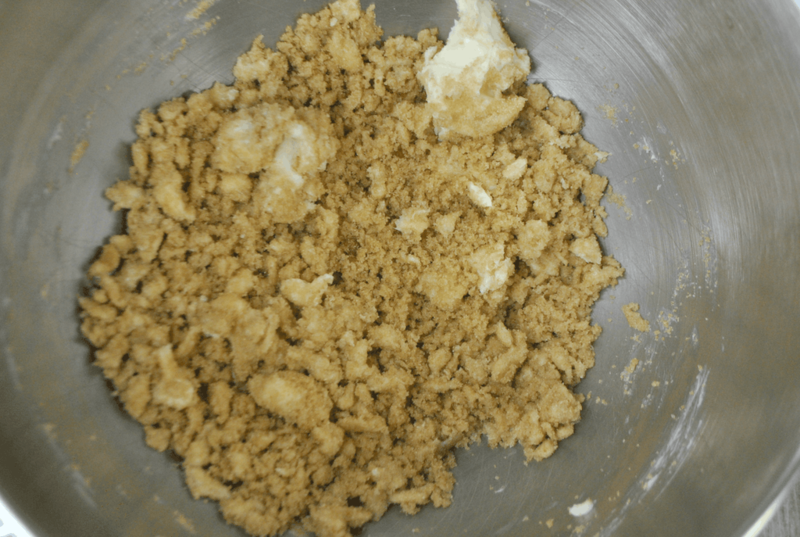 Oh my word – you are going to love the flavor of these cookies! These would be fun to make with the kids, or with girlfriends for a holiday cookie exchange. Don’t forget the wine! 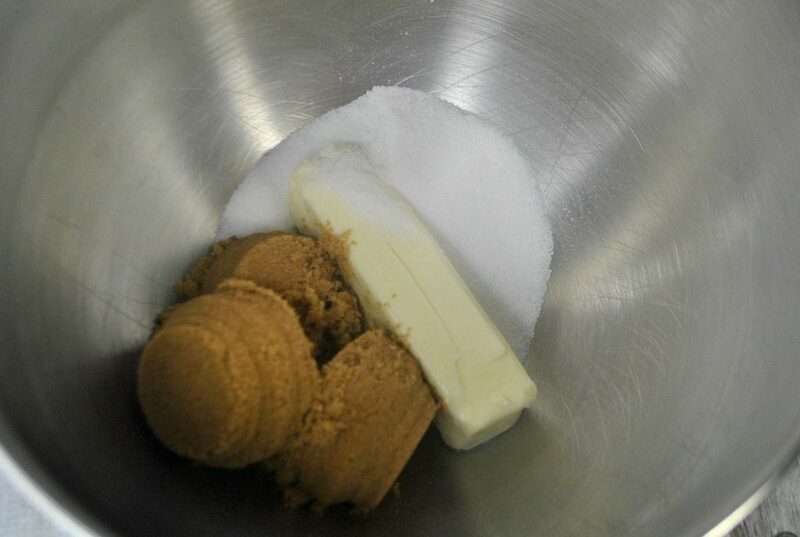 Using a standing mixer beat the butter and both sugars for 1 minute on medium speed until completely smooth and creamy. Mix on medium speed until fluffy and light in color. 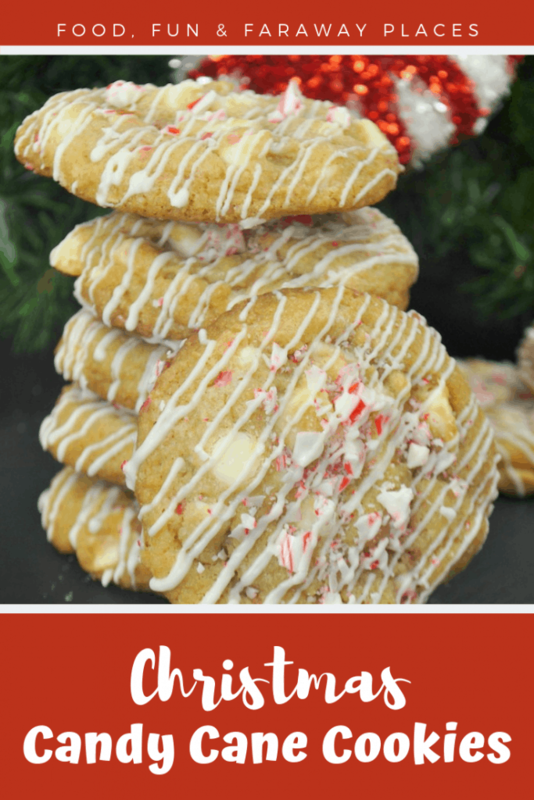 Add the 3/4 C white chocolate chips, 1/2 C chopped peppermint baking chunks, and 1/2 C crushed candy cane, mixing for about 5 seconds until combined. 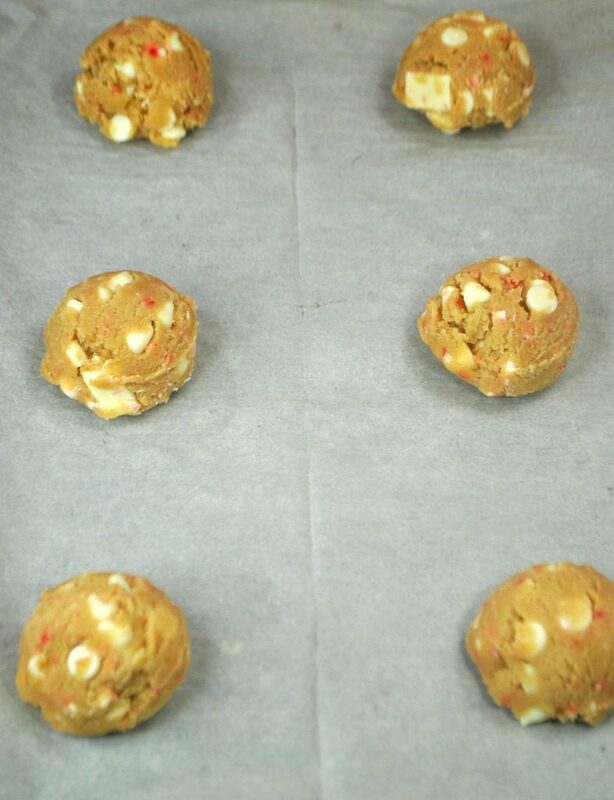 Place 12 cookies onto the baking sheet and bake for 10-12 minutes or until slightly golden brown. Allow cookies to cool for 5 minutes on the cookie sheet. Add the 1/2 C white chocolate chips into a bowl. 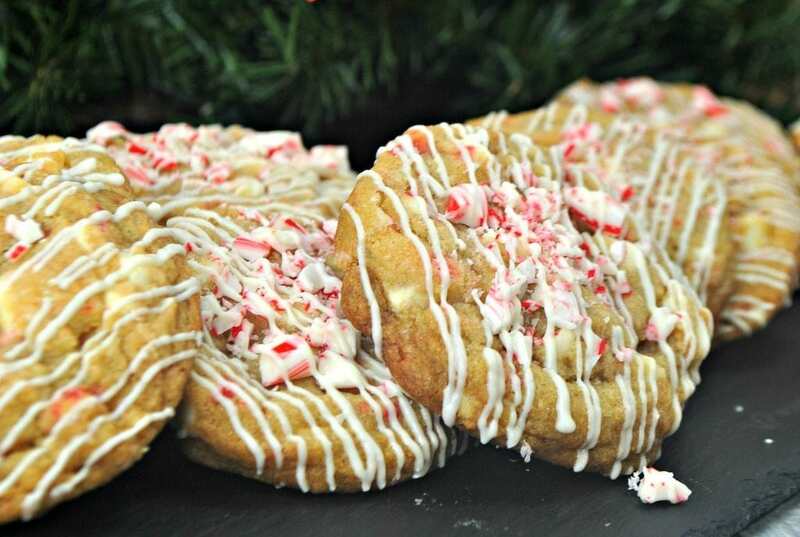 Drizzle melted white chocolate over cooled cookies and sprinkle with remaining crushed candy canes. Aren’t they pretty? I love festive desserts, and this is one I’ll be taking to holiday gatherings. 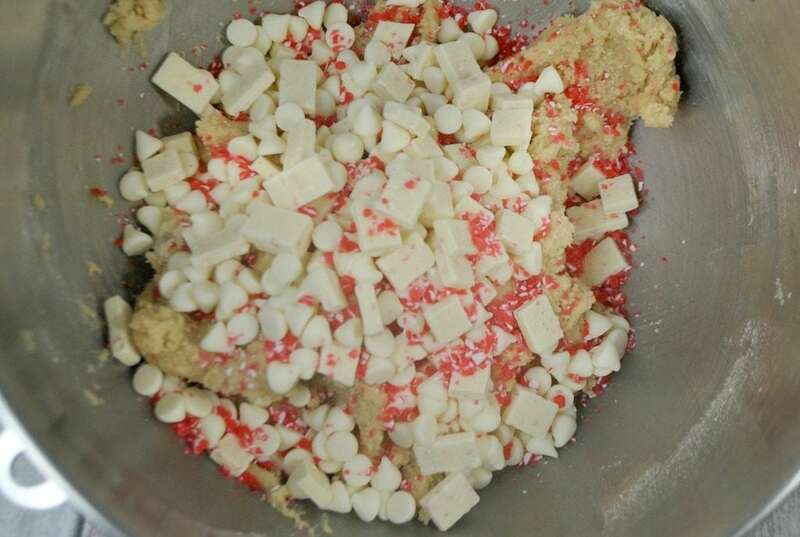 Add the 3/4 C white chocolate chips, 1/2 C chopped peppermint bark baking chunks and 1/2 C crushed candy cane, mixing for about 5 seconds until combined. Stir after each 20-second increment until completely melted. 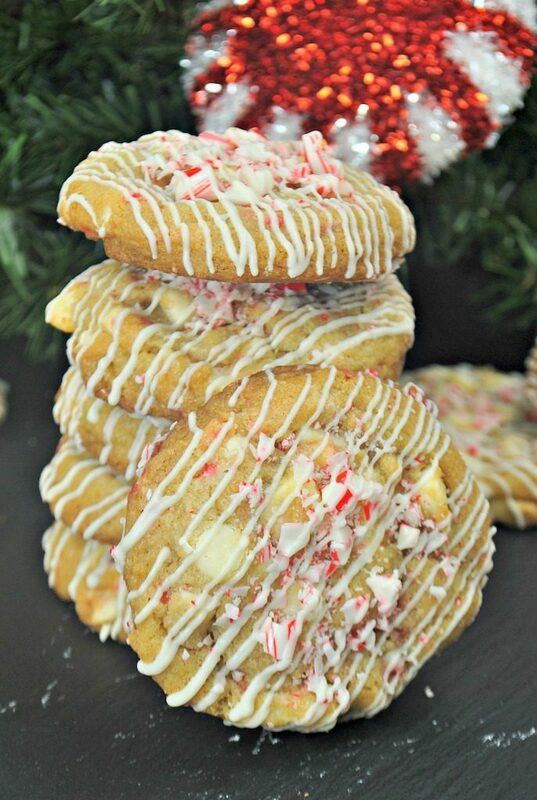 Pin This Candy Cane Cookie Recipe to Pinterest for Later! You will love this Egg Nog custard with Crushed Peppermint. It’s a little more work, but so worth it! For a boozy recipe, try this Spiked Mocha Cappucino! Try these Peppermint Butter Candy Cane Cupakes or these Holly Red Velvet Cupcakes with Peppermint Frosting. Cupcakes are a popular treat for Christmas parties as you don’t need utensils! 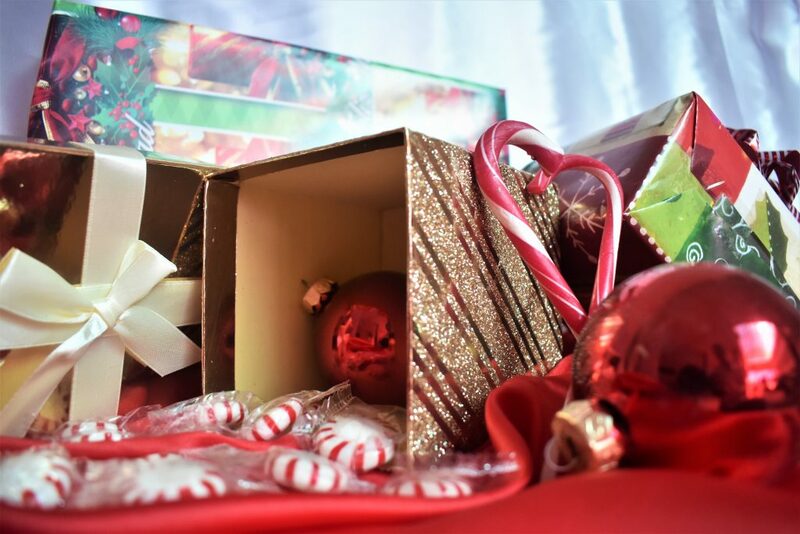 I love Double Chocolate Peppermint Cookies and Peppermint Mocha Cookies because… chocolate! You also might want to try these Kentucky Butter Cookies with Bourbon Glaze!